HKI set out to meet its first challenge. During the 1995-96 school year, phase one of the Honor Project was introduced and implemented into the sixth grade class of WestLake Elementary school in Santa Cruz, California. The 32 children who participated in this pilot project were from diverse cultural and economical backgrounds. Each student initially received My Right of Passage: An Adventure in Self-Discovery Journal. Every day of the pilot program began by a reading of the Honor Code and Honor Pledge. With this in mind, students individually read and thought about the daily Reminder Statement then proceeded by responding to the daily Action Question in their Journal. After students had completed their reflective writing, group discussion began about the topic of the day. The teacher guided the discussion to assure a safe and productive environment. Once a month the HKI facilitor would join the classroom for two hours and focus on how each child’s personal world related to the monthly theme. This allowed for greater emotional disclosure and empathy between the students. The new awareness of relatedness created a more unified atmostphere in the classroom, on the playground and at home. This is how our 1st Grade Pilot Classroom Teacher in CA, is turning our International Honor Pledge First Tradition into a verb for her Students, and teaching reciprocity at the same time. 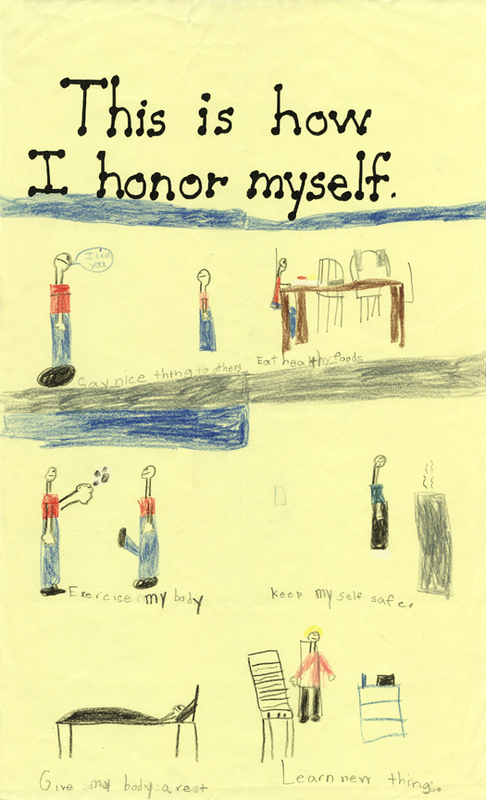 “I Honor Myself.” Instead of memorizing robotically, our pilot teachers are asking children to put into action the traditions and principles of our Honor Pledge and Honor Code. Teachers present the Pledge and Code, then ask the children to find personal meaning in the traditions. They respond by giving back to the teacher the value they found in the traditions. This is one of our ways we role model reciprocity in action — full circle giving/receiving. Read the interview with Don Jacobs and see the children’s comments here.